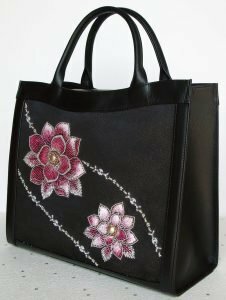 At the Japanese Embroidery Center we offer, in addition to instruction in traditional Japanese embroidery, classes in the fine art of Japanese Bead Embroidery. 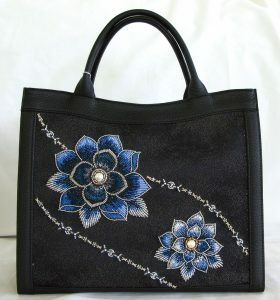 Japanese Bead Embroidery is the integration of beads into Japanese embroidery design and techniques. Japanese beadwork traces its origins to the Meiji period in Japan (1868-1912). The influence of Western taste and fashion on Meiji society brought about the application of Japanese beadwork to traditional Western accoutrements, producing such highly popular accessories as the beaded handbag. The 20th century witnessed a global embracing of the craft, with top Western fashion houses selling the finest silk, lace, velvet and rich brocades enhanced by Japanese bead workers. The exportation of the traditions of Kurenai-Kai (school founded in pre-World War II Japan by the late Master Saito) to America in the last two decades by Reiko Matsukawa of Japan has brought the finest in bead embroidery instruction to the JEC in Atlanta . Flowing Blossoms by Reiko Matsukawa will be offered at the JEC this April at the same time as Open Class, April 12-15. Chelle Monier, one of Reiko Matsukawa’s very talented students, and a certified teacher of Japanese Bead Embroidery will be the instructor. This piece was introduced in Japan during the classes held in September and October, 2016. The blossoms flow across a handbag designed to hold more than the average evening bag. Students will have the choice of blue or rose-colored beads. Techniques will include shading, padding, and attaching a large bead/jewel. If you missed the class in Japan, take advantage of the opportunity in April. Add new skills and gain helpful practice while producing a lovely bag to complement your wardrobe. In the course of beadwork classes, students will enjoy close instruction under Ms. Matsukawa in developing their beading skills to the fullest potential.